Hi! It's certainly starting to feel like spring here in my neck of the woods. The daffodils are going to be blooming soon and I have my first crocus! 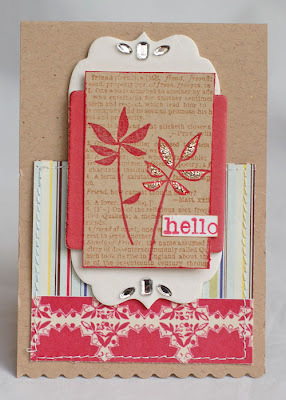 I received some new Papertrey goodies in the mail yesterday and decided to make some cards today. I was going to make one for Dawn's challenge, but I ended up doing two. Here are the colors we had to work with. This first card uses the Wishing You set. The sentiment is from Mixed Messages. For some reason, the teal looks more blue in the photo than it actually is. 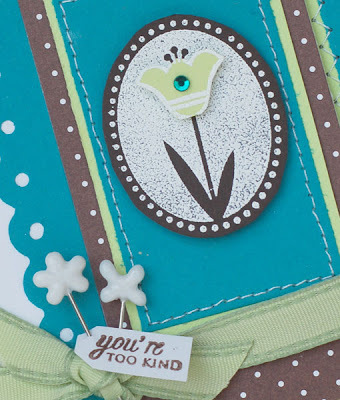 I used white embossing powder on the tulip image. Love that stuff. 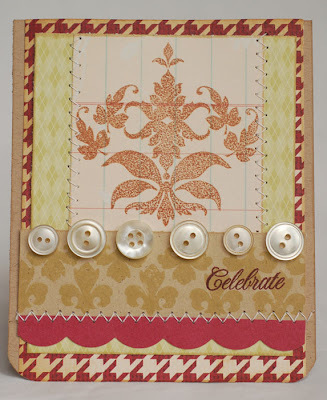 Then, just because I can't stop using the Damask Designs set, I ended up using it on this card. And since Tuesday is my MM blog day, I thought I'd share this little peek of an All About Me page that I did. Don't you love the end of the week? I do! Ryan starts T-ball tomorrow. It's his first time playing. I can't wait to see him in his little uniform. He's so excited. He doesn't want us to call it T-ball, though, he wants it to be BASEball. ;) Kids. Here is my project for Emma's for this week. I have been having so much fun with my Pink Paislee goodies. This card and box set were made with the Fascinating line. I adore the colors!! 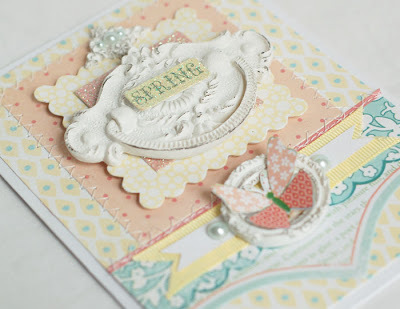 The card is based on a sketch by my sweet friend, Melissa Phillips. Head over to the Emma's blog to see the sketch and the cool projects everyone made with it. I should add that the clear box is the box that the chipboard came in. I thought it would be the perfect size to tuck in some goodies! 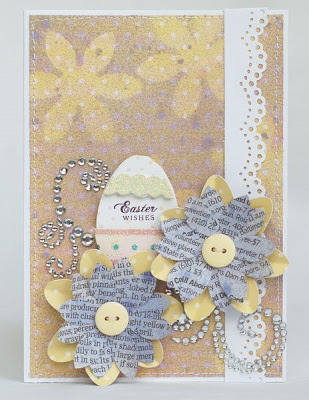 This next card is one that I did using the new Webster's Pages line, 'A Sweet Life". I love the bird and I love those berries! Lisa Pace is hosting another one of her awesome classes. You have to check it out at her BLOG. Her projects NEVER disappoint. I haven't had time to start on them yet, but I'm hoping to next week. Check it out! Finally, I want to let you know about a class that Tania Willis is teaching. Tania suddenly and tragically lost her mother in 2007. 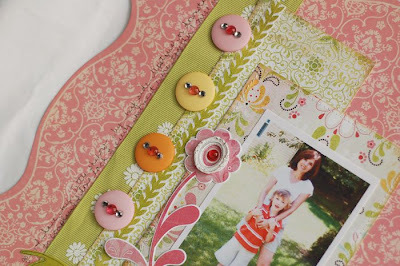 She found that perserving her mother's memory through scrapbooking has been a big part of her healing process. She's decided to share her experience through a class (see below). When I lost my dad, scrapping about him helped me. So, I wanted to share this with you. That's all for today. Hope you have a wonderful Friday! Happy Wednesday! I just finished watching Twilight. Man, I love that Edward Cullen!! I feel like such a cougar. :) (Yes, I got up and started watching it at 5:30 while I worked on a project. If you know me, you know that early mornings are my creative time.) Anyway, I've read the first 3 books and now I've seen the movie. I'm officially hooked! Here is my 2 Sketches 4 You card for the week. 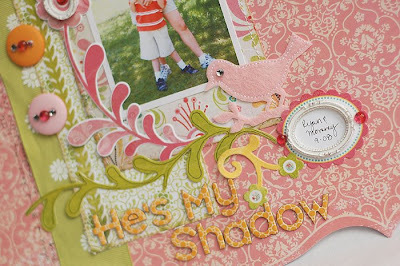 I made the panel on the right side by stampng and embossing with clear powder. Then I spritzed Tiger Lily Glimmer Mist onto it and wiped it off. Glimmer Mists work so well on resists. 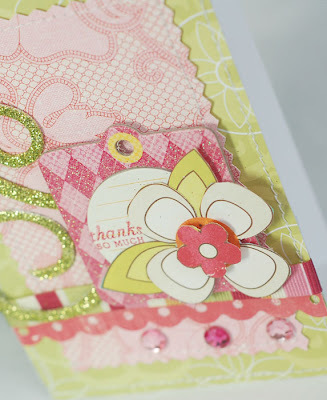 I had wanted to post this card for the Moxie Fab stamping celebration, but I was too late. Oh well. The stamps are close to My Heart and the cute flowers are K and Co. This next card is the one I made for the MMM blog this week. I created the flowers using newspaper and Glimmer Mist. Head over to the blog if you'd like to see the tutorial on how I made it. Finally, keeping exciting news under wraps is really hard for me. 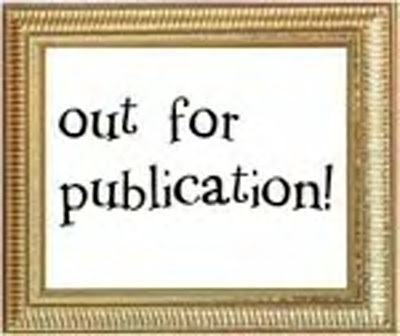 So, though I'm itching to spill the beans on something fun that I'm going to be doing, I can't reveal it quite yet. Hopefully, I can share by the end of the week! Hi. Happy Sunday. We went to church last night so it's been nice just lounging around the house this morning. I got a couple of cards done and thought I'd share them. 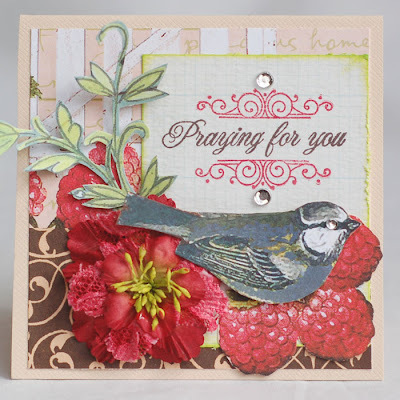 This first card is based off Dawn McVey's new color challenge. As you know, I love Dawn and her designs. 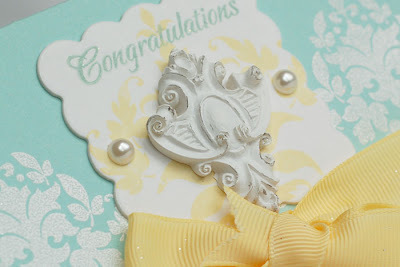 So, I used her Damask Design stamps (again, I know, I can't stop...) on this card. 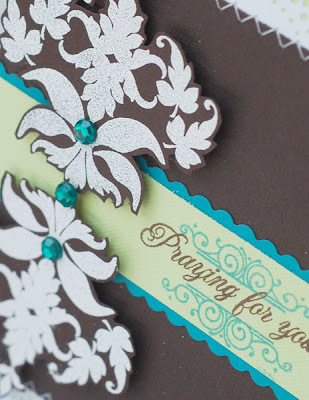 Head over to her blog to see what other people have done with this awesome color combo. This next card is based on this week's CPS sketch. 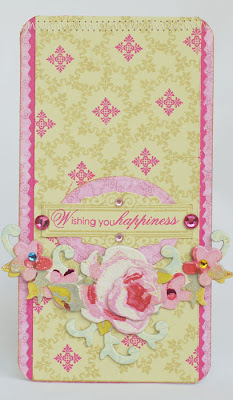 I actually had meant to put another strip of the die cut scallop border along the bottom of the pink panel, but forgot. So, it started off looking more like the sketch. Oh well. That's what I love about sketches. 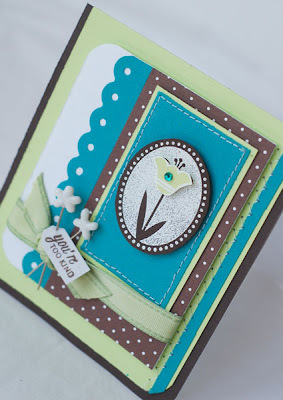 They can inspire you, but your card may end up looking totally different that the original design. Well, I'd best go do something productive. :) A sink full of dishes is calling my name. Ugh! Thanks for stopping by and have a great day! So, on to some fun stamping news. Have you gotten the newest Stamp It! Cards issue? Mine came the other day and it is AWESOME!! 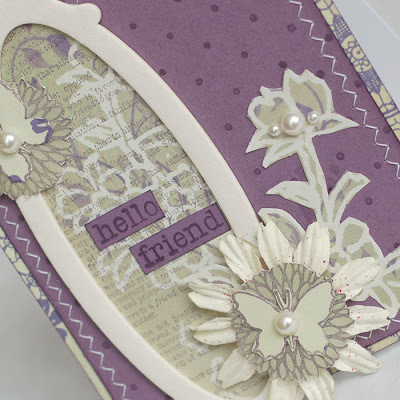 As you know, I'm trying to do more stamping and this issue really inspired me. 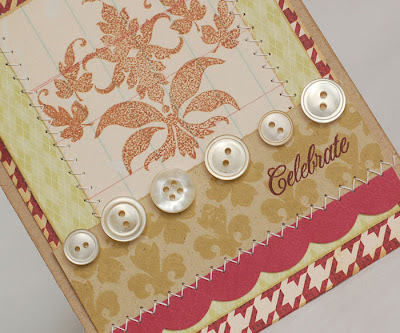 Cath at the Moxie Fab blog, and the girls at the Paper Crafts blog have been celebrating stamping all week. 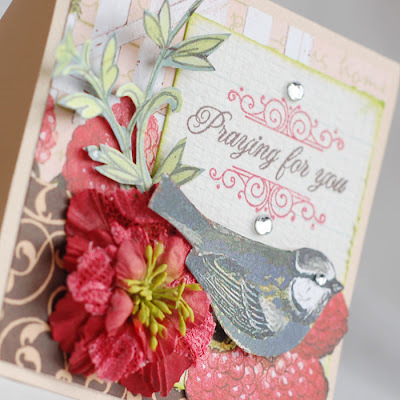 Today at Moxie Fab, Cath is highlighting several stampers who were focused in the issue and I'm honored to be one of them. 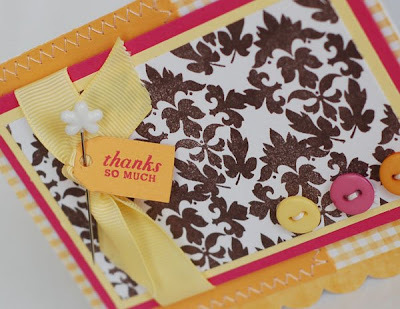 There are 10 amazing cards from some of my favorite stampers. Plus, they are having a HUGE giveaway!!! 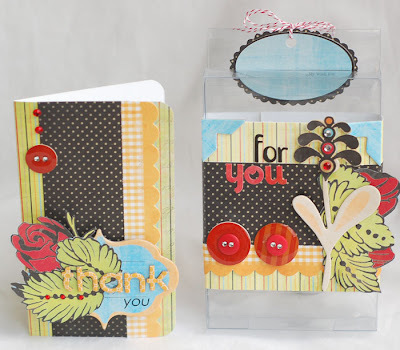 So, head on over and leave a comment on the Moxie Fab World blog for a chance to win a copy of Stamp It!, some American Crafts stamps and embossing powder, as well as a potpourri of stamps from other great manufacturers. 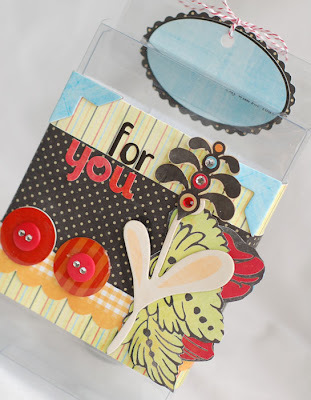 Also, don't forget to hit the Paper Crafts blog. You can leave a comment there and be entered in a drawing for a Copic Marker set worth $70! 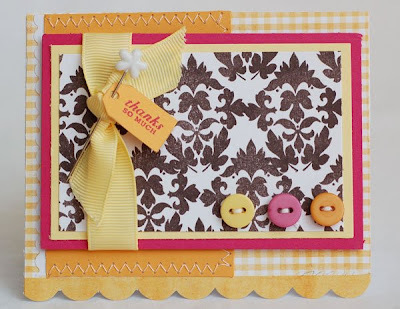 Finally, I'll leave you with this card that uses one of my new favorite stamps sets. It's based on this week's CPS Sketch. 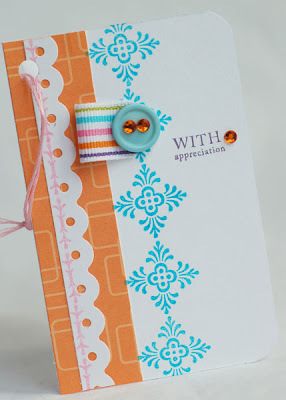 I used Papertrey Ink's Simply Sationery set. I used it to create the background paper. And I used PTI's Recipe Box Labels for the frame and Heartfelt Messages for the sentiment. Thanks for stopping by! I hope you enjoy the First Day of Spring!!! With a name like O'Malley, you know we're celebrating in this house. Ryan and I made green cupcakes yesterday, we all are wearing green today and we're heading to an Irish pub for dinner. :) Hope you're enjoying this day, too! I have a couple of things to share. This first card is for a friend who recently had something nice happen to her. 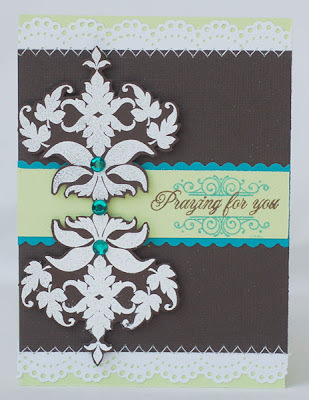 I'm loving this color combo and this PTI Damask Designs set. I could use it on everything!! The ribbon is PTI, too. I added a Melissa Frances resin piece to the center. I've been loving these, lately, too! 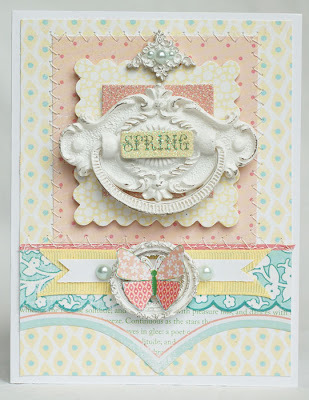 This next card use several resin pieces paired with the new Making Memories spring line. This is my Emma's card for the week. 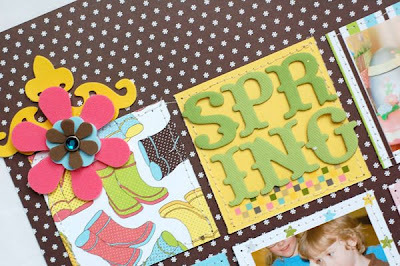 Head over to the blog to see some fun spring inspiration! This last card is based on Kazan's sketch this week at 2S4Y. 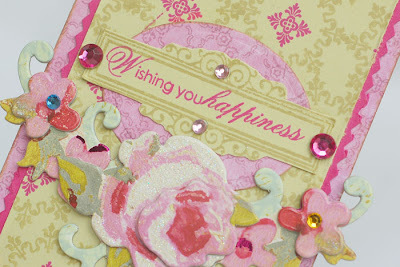 I recently got these Pink Paislee Fascination papers and am in love with them! 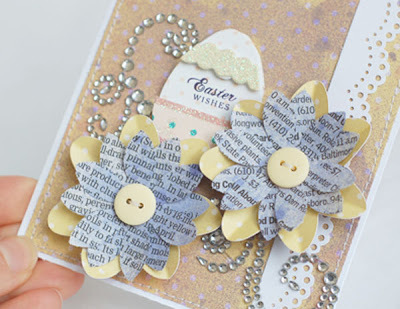 I did a project for Emma's for next week with the and used them on this card, too. 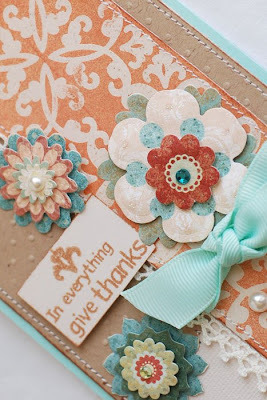 And, since it's Tuesday, you know that I posted at the MMM blog. 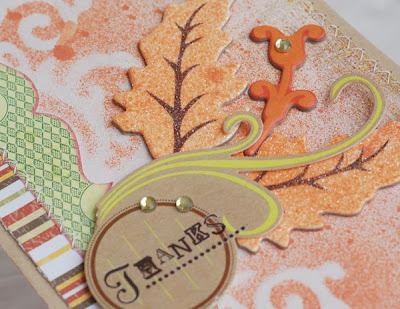 This week, we're all sharing projects made with the new American Crafts lines. They are so fun and perfect for Spring. I love how my layout turned out. I went for something a bit more simple this time - believe it or not! Here's a peek. I recently got my hands on the cutest stamp set. 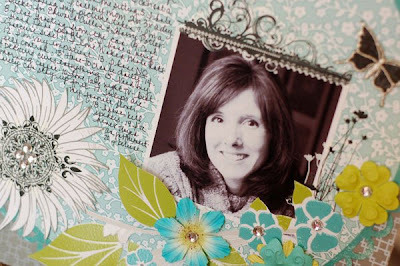 My talented friend, Kim Hughes, just released Collage Elements 1 and I fell in love with it as soon as I saw it. 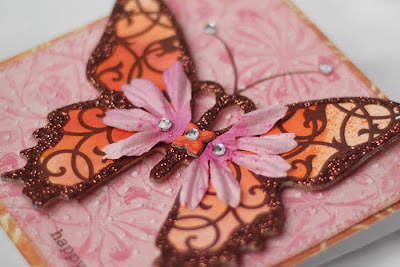 I love the background stamps, the butterflies, the flowers, everything. I got some time to play with them last night and here are a few projects that I came up with. This first one is a simpler card. I adhered the stamped image to a couple of pieces of chipboard and used a small piece of the new Webster's paper behind it. 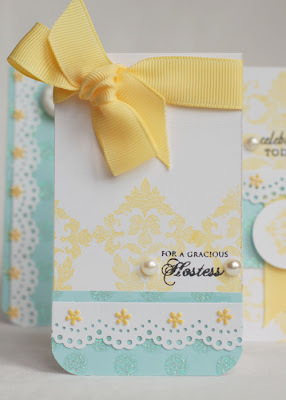 This next card shows how you can use the stamps to make a more shabby or elegant card. 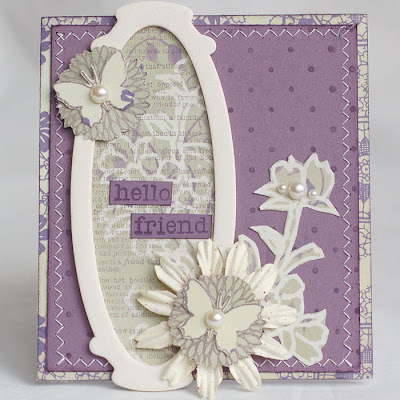 I used the Pin Dot Scrapblock on the purple cardstock. 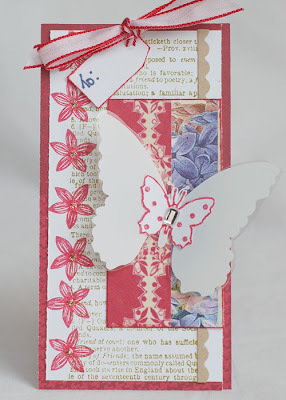 I stamped the round flowers and butterflies and cut them out along with some Webster's flowers that were hand cut from the paper. And finally, I did this little tag. 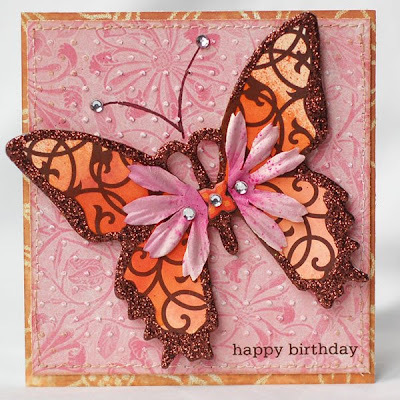 I stamped the background, added a little piece of Webster's paper and cut out the Hambly transparency butterfly which I folded and adhered to give it some texture. 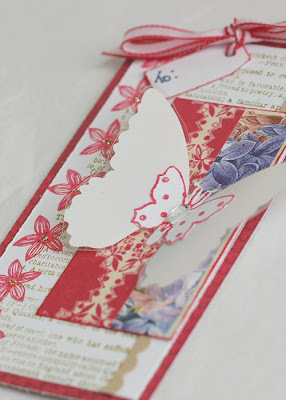 Then I stamped the smaller butterfly and adhered it to it. That's all for now! Thanks for stopping by! Have a great day! I love using pink and green together. 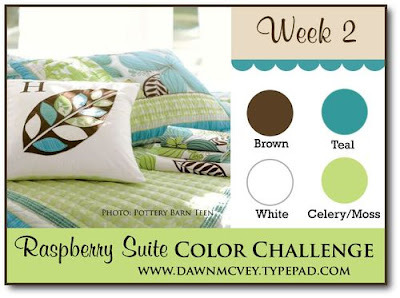 So, when we were given the challenge at Emma's to use those two colors, I was really excited. 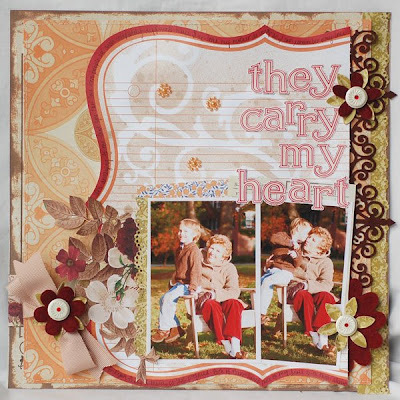 I decided to create the following layout using Making Memories and Basic Grey papers. The journaling is about how Ryan follows me all over the house. I love having a little shadow like him. He'll be in school all day next year (sniff, sniff) so I'm soaking every bit of him up that I can! 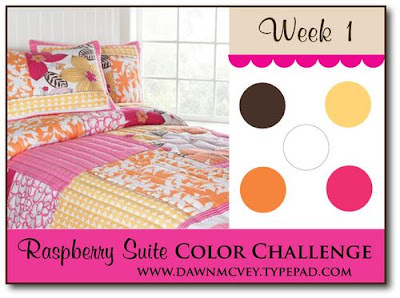 Be sure to head over to the Emma's Blog to see what the other girls did with our challenge! I made some more little gift cards for the MMM blog this week. I'm addicted to them. This set is a bit more graphic than the one in the post below. I used the Simply Stationery Set on them. You can see the rest of the set HERE. Well, that's all for now. Thanks so much for stopping by and, as always, for the kind comments. Have a great day! I received the most wonderful package the other day. It was my first order from Paper Trey Ink. They have amazing stuff! 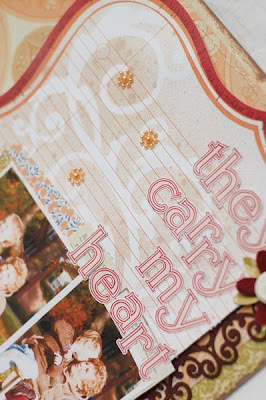 I have been wanting to jump in and try their stamps and was finally pushed over the edge when my friend Dawn McVey released her own designs with them. Her set, Damask Designs is officially my new favorite! I had some time to start playing this morning and came up with a couple of things. This first uses more sedated colors. I think it could be given to a guy! As you know, I don't enjoy making masculine cards, but I totally think this one fits my bill of being a bit elegant, but still masculine. The papers are Dream Street and Jenni Bowlin. The sentiment is from PTI's Mixed Messages set. This next trio is a set of gift enclosure cards. I love this size. They are 4 1/2 by 2 1/2 inches. Perfect to be tucked on a package or in a gift bag. I used some PTI grosgrain ribbon on these, too. That's it for today. I need to get outside and play a bit. It's a balmy 65 degrees. This weather has just been wacky. We were stuck inside with a snowstorm on Monday and Tuesday and yesterday and today we've been playing in beautiful spring like weather. Well, it's midweek already. We had a huge snowstorm so there was no school for two days. It almost feels like a Monday here today. I think Ryan was looking forward to getting back to seeing his friends. I was able to get some things done, though. This firt layout is of my little golfer. He just loves it. He's already asking when we can hit the mini golf course. I can't wait for the weather that will allow us to do that. I used some BG and Sassafrass paper. The dots on the background were made by painting on bubble wrap and laying it on the paper. Then, I added glitter while it was still wet. Here is my card for Kazan's sketch this week. I've had these Colorbok journaling papers and stickers for a while. I decided to use them to make a back to school card. I love that little owl. And finally, I posted this little project on the MMM Blog. It's a box that will hold Ryan's teeth once they fall out. 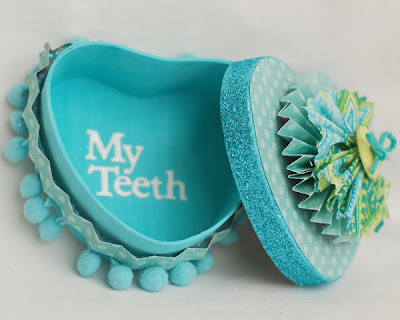 To see the cute little surprise hiding under the lid, visit this post: Tiny Treasures. Well, it's official. I'm in love with everything Tattered Angels. 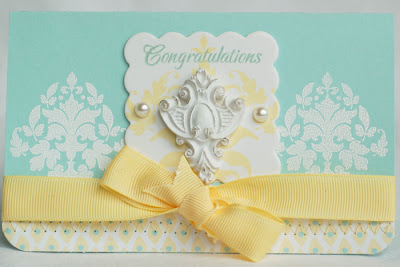 I created the card in the post below for Emma's Paperie's Brithday Celebration. I've got a few other things to share with you. I just can't seem to put down the Glimmer Mist, Chips and Screens! On this first card, I created te background with Glimmer Mist and a Screen. 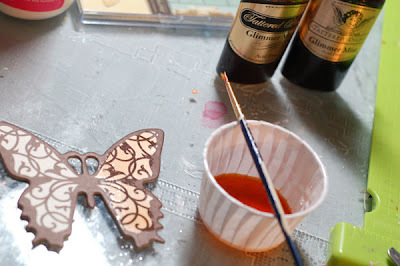 I also used Glimmer Chips that I spritzed with Tiger Lilly and added some glitter. This next card uses a butterfly Glimmer Chip. I painted it using Tiger Lilly mixed with some water. After it dried a bit, I spritzed the center with more GM to create a two toned effect. I painted mod podge on the edges and added the glitter. I adhered this to card using Webster's Pages papers. 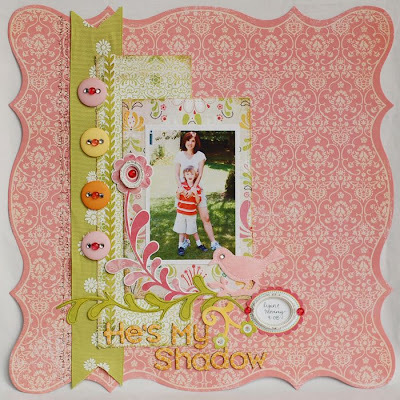 Finally, here is a layout I did using a mix of Webster's Pages and Jenni Bowlin goodies. I used a Glimmer Screen as a mask and sprayed it with Sand GM.